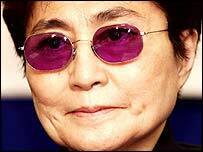 John Lennon's widow Yoko Ono has topped the US dance chart at the age of 71 with a song supporting gay marriage. The track, titled Every Man Has A Man Who Loves Him, is a new version of her song Every Man Has A Woman Who Loves Him, released almost 25 years ago. "This is a victory not just for me but for all Americans who are against the administration's decision to ban gay marriage," Ono said. Citizens in 11 US states voted to ban gay marriage earlier this week. President Bush has said he wants to change the US constitution to specify that marriage can only take place between a man and a woman. Ono has also recorded a lesbian version of her song. It is her second dance hit - she also went to number one with her single Walking on Ice last year. The artist and musician recently performed at a gay rights rally in New York. Her next music project is a new version of the classic track Give Peace a Chance, which she sang with John Lennon. Last month, Ono staged an exhibition showing off Lennon's art to mark what would have been his 64th birthday. Lennon was murdered in 1980. He was shot outside his Manhattan home by Mark Chapman. Chapman was recently refused parole for the third time on the grounds it would "undermine respect for the law" and because of the "extreme malicious intent" of his actions.